Like you, I enjoy roaming the length and breadth of France, a country created for owners of classic cars. Empty roads that wind on forever through unspoiled countryside, wayside restaurants, and hotels, springing up at just the right moment in time. Some say the French are arrogant, rude even, but this is not the case. They are proud, in a way we Brits, because of growing indifference at home, find difficult to comprehend. It is in fact very easy to make the French smile; all one has to do is say please and thank you. Apart from Paris, the Col de Turini, Le Mans and the odd cafe tucked away down a side street somewhere in Calais, where else is there to go in France? By co-incidence, and thanks to Veloce Publishing, I have the answer. And you’re going to like it. 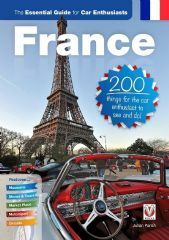 France: The Essential Guide for Car Enthusiasts is a soft-back book, costing no more than a couple of glasses of vin rouge, that tucks nicely in the glove-box. More than that, it describes in some detail over 200 venues, including museums, across the country usually missed as we whizz down the autoroute in search of the sun. For instance, why not stop off at Circuit Automobile du Stadium d’Abbeville (+33 (0)3 22 20 08 65)? Half-an-hour from the coast, this 2.3km-track is open all year. It also offers driving courses, karting and tuition. Even better, the excellent La Maison de l’Epousee B&B is only around the corner. And another, Circuit de Croix-en-Ternois (+33 (0)3 21 03 30 13), situated 60 miles from Calais, off RN39 near St. Omer. Here, Nico Rosberg blitzed the 1.9km-lap in 48 seconds, driving a F3 car. Maybe you just fancy a mooch around, how about the classic car show and important local autojumble at Bourse d’changes at Arras on Sunday 15 March? There are pages given over to Le Mans Classic, Circuit des Remparts (Angouleme), Cite de l’Automobile, once the Schlumpf Collection and now the National Museum at Mulhouse, and of course, Reims, Montlhery, Retromobile and Monaco. So expansive is this book there is always somewhere to go. Finally, I bet you have never been to Manoir de l’Automobile at Loheac, south of Rennes and west of Le Mans. Nor have I. Surprising, considering its location, and it’s one of the largest motor museums in France, with over 400 cars on display, including the Lancia 037 World Championship winning car and 18 ex-F1 cars. Host to several events during the year, it even owns its own circuit; in fact, the whole village plays homage to histoire ‘belle’ voiture. As it would appear, does the rest of France.